Services are scheduled for Saturday, Nov. 25, at the First Presbyterian Church, 205 Fifth St., Dexter, for Rick Coats of Dexter. Coats, 67, passed away Sunday, Nov. 19, 2017. Interment will follow the services at the Hagerman Cemetery. Pallbearers will be Connor Coats, James Tucker, Raul Rodriguez, Damon Tuttle, Josh Luna and Ken Borden. Visitation will be held from 10 a.m. – 6 p.m. Friday at Ballard Funeral Home and Crematory of Roswell. Rick was born Nov. 26, 1949, in Roswell to Richard and Faydean Coats. He grew up in Dexter, attending Dexter Schools. He spent one year at Roswell High when his family moved to Roswell for a short time. Rick graduated from Dexter High School in 1969. At the age of 10, Rick started his career. He shared wonderful stories about working while growing up in Dexter. When he was about 10, he started delivering newspapers in Dexter on his bicycle, and in his teen years, he held different jobs, from being a lifeguard at the Dexter Pool to working at Wortman’s station to working as a farmhand. After graduating from high school, Rick lived in Portales. While there, he decided to become a truck driver. He traveled across the U.S., east, west, south and north, but Dexter was always his home. 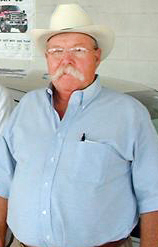 He moved back to Dexter in 1980 and started his sales career in 1988 with Les Francis Chevrolet, Roswell Ford for 12 years, and home to Artesia Ford for the past 13 years. Rick loved his family and friends. Survivors include his wife of 39 years, Sharon “Sherry” Coats; sons Richard Lynn Coats and wife Sharla of Roswell, and Aaron and wife Heather of Dexter; grandchildren Savannah and Genevieve Duran, and Connor and Lealund Coats, all of Roswell, and Kaylee and Elias Coats of Dexter; great-grandson Luke Lodoza; and sisters Darlene Jarvis of Sikeston, Mo., Debbie Wieseler of Omaha, Neb., and Gail Henson of Roswell. He was preceded in death by his father, Richard Coats; his mother, Faydean Butts; and brother Britt Butts. Arrangements are under the direction of Ballard Funeral Home and Crematory.